The Battle of Dazar’alor is now open. The Alliance is set to stage an attack on the heart of the Zandalari empire in a bid to sever the ties of the Zandalari and the Horde, while Horde players will begin the raid by defending against an invasion in the northern jungle of Zuldazar. Along the way, players will get to shift to the other faction’s perspective and take on three additional bosses. For the first time in a raid, your character will transform into the opposite faction (including their associated racial abilities). A dozen new, formidable boss encounters, including Lady Jaina Proudmoore and King Rastakhan himself, await you! Mythic difficulty and Raid Finder Wing 1 will open with scheduled weekly maintenance in each region the week of January 29, 2019. Raid Finder Wing 2 will open the week of February 12, 2019, and Raid Finder Wing 3 will open the week of February 26, 2019. Both the adventures and the war being waged across Azeroth are signified by seasons: times at which many factors and measurements change. Today begins Season 2 of Battle for Azeroth, and you’ll find many new challenges and new rewards are now available in Dungeons and PvP content. A new season of rewards from dungeons has begun. Complete your best Mythic Keystone each week to earn higher item-level gear, and save up your Titan Residuum to purchase new, powerful Azerite items. Item levels of rewards from level 120 Normal, Heroic, and Mythic dungeons have been increased by 30. Baseline rewards are now item-level 340 from Normal, 355 from Heroic, and 370 from non-Keystone Mythic dungeons. The difficulty of Heroic and Mythic dungeons has been increased by 30%. Normal difficulty dungeons are unchanged. Mythic Keystones have been reduced by an additional 3 levels, to account for this difficulty increase. Mythic Keystone rewards have been increased by 30 item levels. During the first week of Season 2, rewards from end-of-run chests will be capped at item-level 385, and the reward cache contains a Season 1 reward. Beginning the second week of Season 2, the weekly cache will not be affected by the cap, and will reward Season 2 items at the higher item levels. Added a new Tier 3 Mythic Keystone affix: Reaping. This bestows the power of Bwonsamdi on all non-boss creatures in the dungeon, giving them a chance to avenge their own deaths. The Infested affix has been removed. Battle for Azeroth PvP Season 2 is now underway. Ranks and ratings have been reset, and you can now begin earning new rewards. Season 2 rewards from PvP sources have been increased by 30 item-levels. This includes Conquest rewards and the weekly chest. Players who earn 500 Conquest points in a given week now receive one Quartermaster’s Coin and an item from that week’s selection. Players might also earn an additional piece of gear or Quartermaster’s Coin each week by using a weekly bonus roll token in PvP. Quartermaster’s Coins can be exchanged for a Warlord’s Trophy, which can be used to upgrade a piece of Sinister Gladiator gear to a higher item level. The PvP reward UI now shows the criteria needed to receive your weekly chest. Elite sets (available to earn for a limited time only) can also be viewed in the Appearances interface on the Sets tab. Players can now work toward earning the Vicious Black Bonesteed or Vicious Black Warsaber. Once earned, fill the bar again to receive a Vicious Saddle, which can be used to purchase a mount from previous seasons. The Gladiator title and achievement are can now be earned by winning 50 games in 3v3 Arenas above a 2400 rating. Players in the top 0.1% at the end of Season 2 in this bracket will earn the Sinister Gladiator title. End-of-match rewards will be capped at item-level 385 during the first week of the season, to maintain parity with other endgame systems until Mythic Battle of Dazar’alor becomes available. New epic Azerite gear is now available from Season 2 PvP, the Battle of Dazar’alor raid, World Quest Emissaries, and from the Mythic Keystone vendor Thaumaturge Vashreen in Zuldazar and Boralus. These new items will have a fifth ring with additional new trait options, starting at Heart of Azeroth level 15. The new ring of traits provides two choices of traits per specialization, allowing players the opportunity to find items that have traits they particularly want and the freedom to create new and interesting combinations that may not have been possible before. Azerite Knowledge will increase weekly from January 22 through March 26. The maximum possible item level is now 425 (was 395). Seals of Wartorn Fate have not been changed or reset, and will be used for Battle of Dazar’alor and other Season 2 bonus rolls. Emissary weapon and armor rewards will scale up to item-level 385 (was 370). Loot from Kul Tiras and Zandalar world bosses will remain at item-level 355. Rewards for in-progress emissary quests may reroll or update when Season 2 begins; the quests themselves won’t reset or change. The Titan Residuum vendor now offers item-level 385, 400, and 415 gear. Titan Residuum is not reset or capped between seasons. Darkshore Warfront rewards have been increased by 15 item levels, and the outdoor world boss and the once-per-cycle quest now award item-level 400 gear. The power of all enemies in the Darkshore Warfront have been increased by 15%, and the item level required to queue for Darkshore is now 335 (was 320). Developers’ notes: These Darkshore changes will take effect after the current Warfront cycle has ended. If an attack is already underway in your region, the Warfront will give Season 1 rewards until the attack phase ends. This is being done to avoid any unfairness to people who had already completed the Warfront or killed the world boss before the start of the new season. Rewards from Arathi Basin and Stromgarde Warfront have not changed. New chapters in the War Campaign are now available. Head to Boralus or Zuldazar to rejoin your faction’s war efforts. Several new Missions are now available at both your War Table, as well as from new drops from various activities, such as Island Expeditions. Look for new Missions to upgrade your faction’s outposts, level up followers so that they gain access to a new equipment slot, send your followers on lucrative new weekly treasure hunts, and unlock a vendor who offers the opposing faction’s pets. Periodically, the Alliance or the Horde will launch an assault against a hostile position in Kul Tiras or Zandalar. When an Assault is active, a group of new World Quests will be available to both factions in that area. Rally to the location to fight on behalf of your faction and earn new Honorbound or 7th Legion Service Medals that can be exchanged for a variety of rewards. Players who have unlocked World Quests at level 120 on at least one character will have Assault World Quests available to any of their other characters. The conflict over the home of the night elves has reached a fever pitch, and new questlines will lead you to the all-new Battle for Darkshore. In this new Warfront, you’ll unlock access to powerful hero transformations that give you temporary abilities themed around your role as a tank, healer, or damage dealer. Contributions for Darkshore as well as the Stromgarde Warfront now operate on a daily cycle. When resources are being mustered, three quartermasters will each put out a request for a different contribution each day. The requested turn-ins have also been adjusted to be more consistent in their value. When your faction controls either Arathi Highlands or Darkshore, world quests will now be available in those zones, in place of the once-per-cycle kill quests that were previously offered for Arathi. New questlines to find and obtain new Heritage armor are available to two mighty races – the dwarves and the blood elves. Available at level 120 to dwarves who are Exalted with Ironforge and blood elves who are exalted with Silvermoon, look for “Keep Yer Feet on the Ground” at the Stormwind Embassy, or “The Pride of the Sin’dorei” at the Orgrimmar Embassy, and get started rediscovering your heritage. Scouts have discovered two new destinations for Island Expeditions – the vrykul land of Jorundall and the Gilnean town of Havenswood. These, as well as the previous Island Expeditions, now feature new enemies, achievements, events, items, and vendors. The logic used to spawn Island Expeditions has been adjusted to favor more organic concentrations of foes, with more clear paths in between, to make it easier to navigate without being forced into combat. The chance for cosmetic rewards are now based on all the enemies and Azerite present on the island, and no longer tied to only the enemy camps your team defeats. Completing an Island Expedition at a higher difficulty increases the chance of receiving these bonus rewards. Battle pets rewarded from the completion of islands that were previously uncageable can now be caged. The weekly quest to recover Azerite now requires 36,000 Azerite (was 40,000). Mythic and PvP Islands now reward 350 Artifact Power (was 300), and PvP Islands now award 50 Conquest on a win (was 8). The weekly Island Expedition quest, and progress towards it, are now visible on the world map. The Island Expedition weekly quest now rewards lucrative new treasure map Missions for your followers. Look for new vendors in Boralus and Dazar’alor who offer exclusive rewards in exchange for your Seafarer’s Dubloons. You can now speak to Archmage Timear in Dalaran above the Broken Isles to access Legion Raid Finder solo or with a private group. Siege of Boralus and Kings’ Rest are now available on Heroic difficulty. Mythic Keystones can no longer be deleted. The new Raid: Battle of Dazar’alor, and Season 2 for PvP and Mythic Keystone Dungeons will begin with the weekly reset in each region starting on January 22, 2019. Many new achievements related to the new Assaults, Island Expeditions, and Warfront are now available. Two new Mythic Keystone Feats of Strength are now available. To earn them, complete all available Battle for Azeroth Mythic Keystone dungeons before the time limit, at +10 and +15 difficulty, by the end of the season. The Family Battler achievement has arrived. Complete 10 challenging family-only pet battle achievements in Kul Tiras and Zandalar to earn your new Wicker Wraith pet. Progress toward the new 100 Exalted Reputations achievement is account-wide. Complete it to earn the Pureheart Courser mount and the “Esteemed” title. Account-bound maps to unlock many flight points on Kul Tiras and Zandalar can be purchased from the War Campaign emissary to send to your alts. The Tortollans have new trinkets they’re willing to share if you’ll help the baby turtles make it to the water. The Meat Wagon mount is now available to players who purchased Warcraft III: Reforged - Spoils of War Edition. You can now target specific kinds of Azerite armor by earning Titan Residuum, which can be used to purchase Azerite armor from everyone’s favorite purveyor of exquisite furnishings: Thaumaturge Vashreen. The item contained in your Mythic Keystone weekly cache can no longer be a piece of Azerite gear. You’ll now receive an amount of Titan Residuum in addition to your weekly item. Higher-level Keystones return greater amounts of Titan Residuum from your weekly cache. Scrapping or disenchanting new epic-quality Azerite gear obtained in Tides of Vengeance (from any source) also provides Titan Residuum. Thaumaturge Vashreen currently offers slot-specific tokens for Azerite gear, equivalent to item levels from Normal, Heroic, and Mythic Uldir. Additionally, specific pieces of Mythic Raid item level Azerite gear may be purchased at a premium price. There is no cap on the amount of Titan Residuum you may collect. When Season 2 begins, Thaumaturge Vashreen will offer new, higher item-level Azerite items at higher Residuum asking prices, while the weekly Mythic Keystone chest reward and the Residuum obtained from destroying higher item-level Azerite pieces increases proportionally. Ancients’ Bulwark – Standing still grants you Versatility and moving grants you healing. Apothecary’s Concoctions – Your damaging and healing abilities have a chance to deal extra plague damage or restore missing health. Endless Hunger – Increases your Versatility and grants you health when you move near an enemy’s corpse. Shadow of Elune – Your spells and abilities have a chance to increase your Haste and grant you increased movement speed at night. Each specialization has had one of its Azerite traits replaced with a new one. Details may be found in the Class changes section below. More new Azerite Traits and armor with a new fifth tier of traits will become available in Season 2 and from Battle of Dazar’alor. The cost of using the Azerite Reforging services available in your faction capital has been reset to the base 5 gold. This cost now decays by 50% every 24 hours, down from 72 hours. New basic equipment for Followers is now available from your Honorbound or 7th Legion reputation vendor. Alchemists can now learn and craft a powerful new Follower item that bypasses the troop penalty on Stealth missions: Vial of Obfuscation. Honorbound and 7th Legion quartermasters in the Warfront muster area in each capital offer new Heirlooms in exchange for Medals. All Battle for Azeroth factions now offer repeatable Paragon reward caches when you earn reputation with them after reaching Exalted. Rewards include toys such as the Bowl of Glowing Pufferfish and companion pets such as the Cobalt Raven. World Quests and Missions now reward more gold. Nomi is back, and he wants you to bring your most dangerous pots and pans to The Valley of the Four Winds for a new brawl in the kitchen. Look to your in-game calendar for round one of this cutthroat culinary conflict. You’re called to an all-new pet dungeon experience. Pick up your first quest to head to Gnomeregan from Radek Fuselock in Dazar’alor or Tizzy Gearjolt in Boralus. 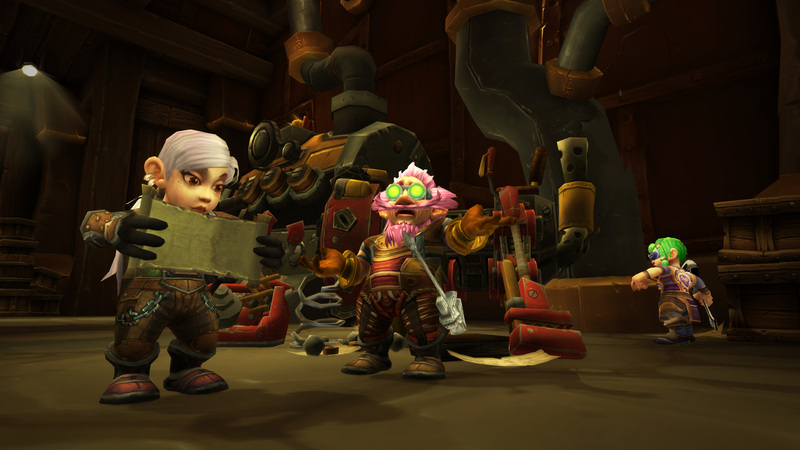 You’ll find the new vendor Micro Zoox just outside Gnomeregan, offering four new companions: Mechanical Cockroach, Leper Rat, Mechantula (a schematic for Engineers to craft and trade), and everyone’s best friend, Alarm-o-Dog. Completing the normal version of the pet dungeon rewards an Ultimate Battle-Training Stone, and completing the Challenge version rewards your very own Mini Spider Tank pet. The Gnomeregan battle pet dungeon does not require that you have completed previous battle pet dungeons. If you’d like to compete head-to-head with other players, the PvP pet battle matchmaker has been improved. Now, players who are new to the PvP battle pet system are more likely to be matched up against other new PvP pet battlers. Keep an eye out for new additions to many Professions, including new gear, new feasts for your raid and dungeon groups, new Jewelcrafting rings, inscription Contracts for increased Honorbound and 7th Legion reputation, and new craftable pets. Learn new Sanguicell recipes for Engineering, Alchemy, Enchanting, and Cooking. Look out for the Enchanting new pet: Enchanted Tiki Mask. Level 111-120 gems can no longer be placed into the sockets of items from previous expansions. Darkmoon Faire quest-based skillups now apply automatically to the most recent expansion profession progress that is not at its maximum. Professions-related World Quests now have a chance to reward Expulsom. Herbalism World Quests now have a chance to reward Anchor Weed. Night elves who complete the new Darkshore questline may earn a new custom appearance that may then be selected at barber shops throughout Azeroth. Partially collected transmog sets will now tell you more information about which missing appearances are relevant to your current character. Items with reputation requirements to acquire no longer require that reputation to apply as a transmog appearance, once acquired. Fist weapons can now be transmogrified over other types of one-handed melee weapons, and vice-versa. If your character’s race or faction cosmetically changes (such as in Battle of Dazar’alor or Mercenary Mode), any Horde or Alliance-centric armor and weapon appearances your character is wearing or has transmogrified to will update to appear as the enemy faction’s version. If you have a transmogrified appearance that isn’t considered valid for the race you change in to, the transmog will be removed and your equipped armor will show, subject to the same faction split. Dungeons from prior expansions will no longer appear when searching for Dungeon groups in the Premade Group Finder. For example, level 120 players will no longer see groups listed for Lower Blackrock Spire. Battle for Azeroth dungeons now automatically change you to a spec that matches the role you chose when you queued. Fixed issues that could prevent groups from using the Premade Group Finder to form or backfill groups for Timewalking raids. When an attempt to queue for an activity fails due to party member eligibility, the group leader is now informed which party members are not eligible. Added new Missions and rewards. Added new World Quests and additional zones: Arathi Highlands and Darkshore. Fixed performance and disconnection issues. Fixed a bug where Azerite Armor Caches showed incorrect item level. Time to level from 1 to 110 has been reduced by approximately 25%. Legion World Quests for the Highmountain Tribe, Nightfallen, Army of the Light, and Argussian Reach now reward increased reputation. The initial chapters of the War Campaign now reward more reputation with the 7th Legion or Honorbound. Most world quests are no longer completable in a raid group, and Premade Group Finder groups for them will automatically delist upon reaching 5 players. Epic world boss quests are still raid-eligible. Rest areas have been added to Hook Point and The Mugambala. A new flight point has been added to The Mugambala. Area damage abilities such as Chain Lightning or Avenger’s Shield can now properly destroy totems or Explosive orbs in Mythic Keystone dungeons if the player targets them directly. Shield users can now block ranged physical attacks. Fixed pathing issues that could cause some spells such as Frozen Orb to become stuck. Troll Berserking reduced to 10% Haste for 12 seconds (was 15% Haste for 10 seconds). Blood Elf Arcane Torrent cooldown increased to 2 minutes (was 1.5 minutes). Azerite Fortification has been removed from all items, and is replaced with another trait that was not already present on the item. Ephemeral Recovery redesigned. It now provides a mana gain when you go below 20% mana. Self Reliance heal now activates when no enemies are within 12 yards (was 20 yards). Death Strike (Rank 2) now reduces the cost of Death Strike by 10 and increases its healing by 60% (was 40%). Veteran of the Third War is now learned by all specs, providing 10% stamina to Frost and Unholy, and 60% to Blood Death Knights. Bloody Runeblade (replaces Embrace of the Darkfallen) - When Crimson Scourge activates, you gain 259 Haste for 5 seconds, and immediately gain 5 Runic Power. Cold Hearted - Icebound Fortitude heals for 1908 every second and its cooldown is reduced by 15 seconds. Frostwhelp's Indignation (replaces Glacial Contagion) - Pillar of Frost summons a Frostwhelp who breathes on all enemies within 20 yards in front of you for 864 Frost damage. Each unique enemy hit by Frostwhelp's Indignation grants you 35 Mastery for 6 seconds, up to 175. Helchains (replaces Horrid Experimentation) - Dark Transformations links you and your pet with chains that deal 467 Fire damage every second to enemies between you for 15 seconds. Magus of the Dead (replaces Festering Doom) - Apocalypse and Army of the Damned additionally summon a Magus of the Dead who hurls Frostbolts and Shadowbolts at your foes, dealing 933 each. Bonestorm now heals you for a maximum of 15% of your health. Purgatory no longer clears on death. Will of the Necropolis now reduces damage taken below 30% by 30% (was 35% reduction below 35% health). Breath of Sindragosa damage decreased by 10%. Dreadwake Armor 2-piece bonus value reduced to 3% (was 15%). All Will Serve Skulker Shot damage reduced by 15%. Bursting Sores now affects all nearby targets. Death and Decay’s Necrotic Strike now also hits up to 3 additional targets. Chaos Brand now triggers from all damage (was only Fire/Chaos damage). Chaotic Transformation (replaces Unbound Chaos) - Demon Blades / Demon's Bite deals 283 additional damage. When you activate Metamorphosis, the cooldown of Eye Beam and Blade Dance is immediately reset. Hour of Reaping (replaces Gaping Maw) - Lesser Soul Fragments restore 467 additional health, and every 40 Soul Fragments you consume causes your next Soul Cleave to grant you a Soul Barrier. Revel in Pain now additionally causes Fiery Brand to last 10 seconds. New: Thrive in Chaos - Each Fury / Pain spent heals you for 10 / 25 Health. Vengeful Retreat is no longer subject to the global cooldown. Wild Charge is no longer subject to the global cooldown. Arcanic Pulsar (replaces Sunblaze) - Starsurge's damage is increased by 429. Every 9 Starsurges, gain Celestial Alignment for 6 seconds. Autumn Leaves healing reduced by 25%, and now increases Rejuvenation duration by 1 second. Burst of Savagery (replaces Craggy Bark) - Consuming Gore grants you 104 mastery for 5 seconds and has a 15% chance to activate Gore. Early Harvest (replaces Fungal Essence) - When Wild Growth expires, it heals the target for 291 if they are injured or it reduces the cooldown of Innervate by 1 sec if they are not. High Noon now increases Sunfire periodic damage instead (was direct damage). Jungle Fury (replaces Shredding Fury) - Tiger's Fury increases your critical strike by 339 and lasts 12 seconds. Power of the Moon now increases Moonfire periodic damage (was direct damage), and now grants Moonfire periodic damage a chance to grant Lunar Empowerment. Reawakening Absorption doubled, and now grants the target of your Rebirth a Well Fed buff. New: Switch Hitter - An ability from your chosen Affinity grants an additional bonus for 20 seconds. Untamed Ferocity (replaces Raking Ferocity) - Combo-point generating abilities deal 86 additional instant damage and reduce the cooldown of Berserk by 0.3 seconds. Mastery: Starlight now affects Starsurge and Solar Empowerment at full value (was half value). Stellar Flare damage increased by 25%. Twin Moons damage bonus to Moonfire reduced to 10% (was 20%). Feral spec aura no longer has a hidden 25% bonus to Haste. Mastery: Razor Claws now includes finishing moves. Ferocious Bite no longer refreshes the duration of Rip if the target is below 25% health. Maim Energy cost reduced to 30 (was 35), and damage increased by 50%. New: Primal Wrath - Finishing move that deals instant damage and applies Rip to all enemies within 10 yards. Lasts longer per combo point. Shred damage increased by 20%, and damage bonus from stealth reduced to 30% (was 50%). Rip Energy cost reduced to 20 (was 30), combo points now increase the duration (was damage), and lasts longer per combo point. Savage Roar now grants 10% damage (was 15%), and now grants 10% Energy regeneration rate. New: Scent of Blood - Each enemy hit by Thrash reduces the cost of Swipe by 3 Energy for the next 6 seconds. All damage abilities increased 12%. At level 80, Guardian Druids now learn Stampeding Roar (Rank 2), which reduces the cooldown of Stampeding Roar by 1 minute. Ursol’s Vortex (replaces Intimidating Roar) - Conjures a vortex of wind for 10 seconds at the destination, reducing the movement speed of all enemies within 8 yards by 50%. The first time an enemy attempts to leave the vortex, winds will pull that enemy back to its center. Tranquility direct healing reduced by 10%, and heal-over-time healing reduced by 40%. Wild Growth healing increased by 10%. Beast Lore now shows spec and abilities. Many creatures that were previously untamable can now be tamed by Hunters. Hunter shots now visually fire from the correct attachment point. The spell visuals for Barrage have been improved. Dire Consequences (replaces Pack Alpha) - Kill Command deals 525 additional damage, and has a chance to summon a Dire Beast. New: Nature’s Salve - Exhilaration heals you for an additional 11505 health, and its cooldown is reduced by 15 seconds. Primeval Intuition (replaces Up Close and Personal) - Your maximum Focus is increased and Mongoose Bite / Raptor Strike increases your Critical Strike by 10 for 12 seconds, stacking up to 5 times. Surging Shots (replaces Arcane Flurry) - Rapid Fire damage is increased per shot fired. This damage starts lower and increases per shot of Rapid Fire. Aimed Shot has a 15% chance to reset the cooldown of Rapid Fire. Your second Animal Companion will now Play Dead and benefit from Mend Pet. Dire Beast now properly includes beasts from Kul Tiras and Zandalar. Aimed Shot damage increased by 20% and no longer has a +50% damage bonus if it is the first shot against a target. Arcane Shot damage increased 25%. Bursting Shot now snares for 6 seconds (was 4 seconds), can no longer be dodged, and knocks targets back much farther. Careful Aim is now a 100% chance to deal 50% increased Aimed Shot damage (was a 50% chance to deal 100% increased Aimed Shot damage). Disengage can now be used while using Rapid Fire without breaking the channel. Lethal Shots redesigned. Arcane Shot and Multi-Shot have a 20% chance to reduce the cooldown of Rapid Fire by 5 seconds. Lone Wolf now ramps up to maximum effect 20 seconds after dismissing your pet (was 50 seconds). Multi-Shot damage increased 25%, and radius increased to 10 yards (was 8). Piercing Shot now ignores armor and can no longer be blocked. Precise Shots bonus reduced to 75% (was 100%). Serpent Sting damage increased by 15%. Steady Shot now also increases the duration of Concussive Shot on a target by 3 seconds. Streamline additional Rapid Fire duration reduced to 20% (was 30%). Trick Shots additional damage increased to 50% (was 40%). Trueshot redesigned. Reduces the cooldown of your Aimed Shot and Rapid Fire by 60%, and causes Aimed Shot to cast 50% faster. Volley now has a greater chance to activate and does less damage. Harpoon is no longer subject to the global cooldown. Cold Snap can once again be used while in Ice Block. Blaster Master's effect now has a maxiumu of 3 stacks. Brain Storm now also makes Evocation grant 2 Arcane Charges immediately. Equipoise (replaces Anomalous Impact) - When you are above 70% mana, Arcane Blast deals 150 additional damage. When you are below 70% mana, Arcane Blast's cost is reduced by 190. Flash Freeze (replaces Winter's Reach) - Each of your Icicles deals 897 additional damage, and when an Icicle deals damage you have a 3% chance to gain the Fingers of Frost effect. New: Quick Thinking - Your instant cast damaging spells heal you for 784. Wildfire (replaces Preheat) - Pyroblast deals 937 additional damage. When you activate Combustion, you gain 768 Critical Strike, and up to 4 nearby allies gain 96 Critical Strike for 10 seconds. Blizzard now applies a 50% snare for 1.5 seconds (was 50% snare for 15 seconds) and range increased to 40 yards (was 35 yards). Comet Storm damage reduced by 10%. Frostbolt now applies a 50% snare for 8 seconds (was 50% snare for 15 seconds). Frozen Orb now applies a 30% snare for 3 seconds (was 50% snare for 15 seconds). Regalia of the Arcane Tempest 2-piece set bonus reduced to 4% crit damage (was 20%). Crackling Jade Lightning initial tick and damage per-tick reduced 20%. Burst of Life now additionally reduces the cooldown of Life Cocoon by 20 seconds. Dance of Chi-Ji (replaces Meridian Strikes) - Spending Chi has a chance to make your next Spinning Crane Kick free and deal 2966 additional damage. New: Exit Strategy - Rolling grants you 73 Avoidance for 2 seconds. Taking non-periodic damage in this time reduces the cooldown of Roll by 5 seconds. Fury of Xuen (replaces Iron Fist) - Your Combo Strikes grant you the Fury of Xuen, giving your next Fists of Fury a 2% chance to grant 1200 Haste and invoke Xuen, The White Tiger for 8 seconds. Glory of the Dawn (replaces Swift Roundhouse) - Rising Sun Kick has a chance to trigger a second time, dealing 11526 Physical damage and restoring 1 Chi. Secret Infusion (replaces Invigorating Brew) - After using Thunder Focus Tea, your next spell gives 80 of a stat for 10 seconds. Straight, No Chaser (replaces Niuzao’s Blessing) - Ironskin Brew increases your Armor by 69, and has an 8% chance to not consume a charge. Base Stagger amount reduced to 105% of Agility (was 140%). Ironskin Brew increases Stagger by 270% (was 250%). Black Ox Statue threat radius reduced to 20 yards (was 30 yards). Enveloping Mist healing reduced by 13%. Soothing Mist is no longer dispellable. Good Karma redesigned - 100% of the damage redirected by Touch of Karma also heals you. Rushing Jade Wind now has a 1 Chi cost, a 6 second duration, and 6 second cooldown. Touch of Death damage reduced to 35% of your maximum health (was 50%). Touch of Karma damage redirected is now 70% of absorbed damage (was 100% of absorbed damage). Paladin Divine Steed glyphs from the Legion Order Hall are now accessible account-wide. Divine Revelations now additionally increases Infusion of Light-buffed Flashes of Light. New: Empyreal Ward - Lay on Hands grants the target 259 armor for 1 minute. Empyrean Power (replaces Divine Right) - Your attacks have a chance to make your next Divine Storm free and deal 2559 additional damage. Glimmer of Light (replaces Martyr's Breath) - Holy Shock leaves a Glimmer of Light on the target for 30 seconds. When you Holy Shock, all targets with Glimmer of Light are damaged for 421 or healed for 730. Light's Decree (replaces Zealotry) - Spending Holy Power during Avenging Wrath causes you to explode with Holy light for 1182 damage per Holy Power spent to nearby enemies. Avenging Wrath's duration is increased by 5 seconds. Righteous Conviction (replaces Dauntless Divinity) - Your Light of the Protector heals for 1290 additional healing, and is always increased by 200% during Avenging Wrath. Holy Paladin spells and visuals have been updated. Hand of the Protector bonus is now based on your target’s missing health. Consecration damage increased by 20%. Fixed a bug that prevented consecutive Divine Purpose procs. To compensate, Divine Purpose damage and healing increased reduced to 20% (was 30%). Divine Storm damage increased by 20%. Greater Blessing of Kings absorption increased 19% and can no longer stack. Greater Blessing of Wisdom no longer restores health, only mana, and can no longer stack. New Talent: Ultimate Retribution - When an ally within 40 yards falls below 25% health, you gain Avenging Wrath for 6 seconds. When an ally is slain within 40 yards of you, your Redemption spell can now be cast while in combat within the next 20 seconds, with a 6 second cast time. Using Divine Shield or Blessing of Protection on yourself will cancel this effect. Focused Will now stacks to a maximum of 1 (was 2). Halo damage and healing reduced 6%. Power Word: Shield applies Weakened Soul, preventing the same caster from recasting it on the same target for 7.5 seconds. New: Death Denied - Leap of Faith absorbs the next 10,736 damage to the target within 10 seconds. While the shield holds, Leap of Faith cools down 200% faster. Depth of the Shadows healing bonus increased 100%, and now increases Atonement duration, when applied by Shadow Mend, by 2 seconds. Promise of Deliverance (replaces Sacred Flame) - For 10 seconds after you cast Holy Word: Serenity, Heal and Flash Heal heal for an additional 472, and reduce the cooldown of Holy Word: Serenity by an additional 1 seconds. Searing Dialogue now also causes Mind Sear to snare targets hit by Mind Sear by 30% for 1 second. Sudden Revelation (replaces Gift of Forgiveness) - Power Word: Radiance has a 50% chance to cause your next Holy Nova to deal 1470 additional damage and reduce the cooldown of Power Word: Radiance by 3 seconds. Thought Harvester redesigned. Vampiric Touch damage is increased, and each time Vampiric Touch deals damage you have a chance to increase the damage of your next Mind Sear within 20 seconds by 300%. Whispers of the Damned redesigned. Mind Blast now deals additional damage and generates additional Insanity on critical strikes. Damage of Smite and Shadow Word: Pain reduced by 11%. Damage of Shadowfiend, Mindbender, Purge the Wicked, Schism, and Power Word: Solace reduced 8%. Atonement heals for 55% of damage done (was 60%). Body and Soul no longer has a 6 second internal cooldown. Evangelism cooldown increased to 90 seconds (was 75 seconds). Power Word: Shield cost increased to 2.65% of mana (was 2.5%). Rapture additionally allows you to ignore Weakened Soul. Benediction proc rate decreased to 25% (was 30%). Binding Heal healing reduced to 67% of spell power (was 75%), and now costs 2.9% of mana (was 2.4%). Focused Will (rank 2) allows it to stack to 2. Greater Fade now cancels when the Priest takes a hostile action. Holy: Word Salvation initial healing reduced to 110% (was 150%). Renew healing increased by 15%. Trail of Light now affects Heal as well as Flash Heal and replicates 35% of the initial cast (was 40%). Shadow Priests now have Focused Will. Dispersion damage reduction increased to 75% (was 60%), and now also increases movement speed by 50% for its duration. New: Intangibility (replaces Mania) - Dispersion heals for 50% of your maximum health over its duration and has 30 seconds reduced cooldown. Hallucinations is now a passive ability for all Shadow Priests (was a PvP talent). Legacy of the Void now increases Voidform’s damage bonus by 5%. Mind Bomb duration increased to 6 seconds (was 5 seconds). Mind Sear damage increased by 20%. Power Word: Shield no longer has a cooldown. Psychic Scream damage break threshold increased by 40% against non-players. Shadowform no longer provides 10% physical damage reduction. Surrender to Madness cooldown reduced to 3 minutes (was 4 minutes), and Insanity generation penalty duration reduced to 15 seconds (was 30 seconds). Voidform now increases spell damage by 20% (was 10%), and Insanity drain increase reduced by 7.5%. Void Bolt Insanity generation increased to 20 (was 16). Void Torrent damage increased by 20%, now generates 25 Insanity over its duration, and no longer requires Voidform. Blade in the Shadows now reduces the cost of Shadowstrike by 2 Energy as a non-stacking bonus. Damage bonus reduced by 40%. Echoing Blades (replaces Fan of Blades) - Fan of Knives damage is increased by 321. For each of the first 5 critical strikes, it will fire a second spray of knives at that location, dealing 1282 damage to enemies within 8 yards. Keep Your Wits About You (replaces Storm of Steel) - Each time an attack Blade Flurries, increase the chance for Sinister Strike to strike again by 2%. Additional strikes of Sinister Strike deal 1844 more damage. New: Lying in Wait - While no enemy is within 12 yards, heal for 689 every second. While any enemy is within 12 yards, gain 173 Speed. Nothing Personal (replaces Poisoned Wire) - Vendetta poisons the target, dealing 11049 damage over 20 seconds, and grants you 40 energy over 20 seconds. Perforate now reduces the cooldown of Shadow Blades by 0.5 seconds when Backstabbing an enemy from behind. Replicating Shadows (replaces Sharpened Blade) - Each combo point spent has an 2% chance to cause your Nightblade to deal 5843 Shadow damage and spread to a nearby enemy. The First Dance redesigned. Activating Shadow Dance now grants you Combo Points and increases your Haste for its duration. Shuriken Combo (baseline passive) removed. Shuriken Storm damage increased by 35%. Capacitor Totem and Earthbind Totem range increased to 40 yards. Spirit Wolf is now available when you’re dead. New: Ancient Ankh Talisman - While Reincarnation is off cooldown, your maximum health is increased by 2590. While you are at full health, Reincarnation cools down 50% faster. Tectonic Thunder (replaces Rumbling Tremors) - Earthquake deals 596 Physical damage instantly, and has a 25% chance to make your next Chain Lightning be instant cast. Spouting Spirits healing reduced by 15%, and now increases Spirit Link Totem radius by 15%. New: Thunderaan’s Fury - Stormstrike deals 271.5 additional damage, and has a 15% chance to summon Thunderaan's Fury Totem, doubling the chance to activate Windfury Weapon for 12 seconds. Turn of the Tide (replaces Ebb and Flow) - Both bonuses of Tidal Waves are increased 5%, and spells affected by it heal for an additional 859. New: Call the Thunder - Your maximum Maelstrom increased by 30, and the Maelstrom cost of Earth Shock and Earthquake is reduced by 10. Earth Shock damage reduced by 16%. Earthquake range increased to 40 yards. Elemental Blast overloads will now always grant a separate secondary stat buff from the primary spell and the overloaded spell. Flame Shock duration increased to 24 seconds (was 18 seconds). Icefury now generates 25 Maelstrom (was 15), overload generates 12 Maelstrom (was 8), now causes your next 4 Frost Shocks to generate 8 Maelstrom, and bonus damage increased to 200% (was 100%). Master of the Elements can now also buff your next Physical damage spell. Lightning Bolt damage increased by 40%. Stormkeeper now also increases the damage of your next two Lightning Bolts (and their overloads) by 150%. New: Surge of Power - Earth Shock also enhances your next spell cast within 15 seconds (Flame Shock, Lightning Bolt, Lava Burst, Frost Shock). Boulderfist damage increase is now 35% (was 20%). Crashing Storm damage increased by 40%. Forceful Winds damage per stack reduced to 80% (was 100%). Fury of Air damage increased by 40%. Hailstorm damage increased by 50%. Landslide proc chance increased to 40% (was 20%). Lightning Shield overcharge no longer generates Maelstrom. Overcharge cooldown reduced to 9 seconds (was 12 seconds). Totem Mastery Storm Totem increased to 10% Stormstrike damage (was 5%). Chain Heal healing increased 33%. High Tide redesigned. Every (40,000 at level 120) mana you spend brings a High Tide, making your next 2 Chain Heals heal for an additional 20% and not reduce with each jump. Unleash Life now heals for 130% (was 110%), increases the next heal by 35% (was 45%), and costs 4% mana (was 5%). Players can now summon other players in their group who are present in the same dungeon. All Warlocks now have Demonic Embrace (passive) – Stamina increased by 10%. Imp Firebolt damage increased by 25%. Felhunter, Succubus, and Voidwalker damage increased by 15%. Baleful Invocation (replaces Forbidden Knowledge) - Your Demonic Tyrant's Demonfire deals 375 additional damage, and summoning your Demonic Tyrant instantly generates 5 Soul Shards. Chaos Shards (replaces Accelerant) - Incinerate damage is increased by 198, and when you fill up a Soul Shard, you have a 5% chance to generate an additional full Soul Shard over 2 seconds. Inevitable Demise is now triggered by Agony (was Corruption), and stacks up to 50 times (was 100). Pandemic Invocation (replaces Deathbloom) - Refreshing Corruption, Agony, or Siphon Life will deal 692 Shadow damage and has a chance to grant you a Soul Shard. New: Terror of the Mind - You steal 770 health every 1 second from targets affected by your Fear spell. Unstable Affliction damage reduced by 9%. Bilescourge Bombers damage increased by 50%. Demonic Consumption – each Wild Imp consumed now has a chance to proc Demonic Core, and your Tyrant’s damage bonus per energy consumed has been increased by 100%. The Demonic Tyrant’s summon duration extension now also applies to any demons summoned from the Nether Portal. Felguard spell power scaling increased by 15%, and Legion Strike damage additionally increased by 20%. Nether Portal duration changed to 15 seconds (was 20 seconds), and cost reduced to 1 soul shard (was 3). All pets that can come out of the Nether Portal now deal 25% increased damage. Sacrificed Souls additional damage per demon reduced to 4% (was 5%). Rain of Fire range increased to 40 yards (was 35 yards). Battle Shout now correctly increases auto-attack damage by 10%. Bastion of Might (replaces Reinforced Plating) - Avatar increases your Mastery by 106 for 20 seconds, and instantly grants you Ignore Pain. Cold Steel, Hot Blood (replaces Bloodcraze) - Bloodthirst critical strikes generate additional Rage and inflict a Gushing Wound that leeches health over 6 seconds. Crushing Assault Slam damage increased to 10,800 (was 7,060). Gathering Storm redesigned. Now while Bladestorming, you gain movement speed and strength, stacking. New: Intimidating Presence - Intimidating Shout reduces the movement speed of affected enemies by 50%, and prevents the next 8109 damage they deal after Intimidating Shout ends. Lord of War's rage generation effect no longer stacks if multiple versions of the trait are equipped. Striking the Anvil (replaces Executioner’s Precision) - The Tactician effect improves your next Overpower, causing it to deal 902 additional damage and reduce the remaining cooldown of Mortal Strike. Unbridled Ferocity (replaces Trample the Weak) - Rampage deals additional damage and has a 8% chance to grant you Recklessness. Charge is no longer subject to the global cooldown. Execute now refunds 20% of Rage spent if the target doesn’t die (was 30%), and no longer doubles the amount of rage refunded during Sweeping Strikes. Ignore Pain is no longer subject to the global cooldown. Intercept is no longer subject to the global cooldown. Shield Block recharge time reduced to 16 seconds (was 18 seconds). Vanguard now increases Stamina by 45% (was 40%), and armor by 60% of Strength (was 50%). The reward bonuses from War Mode can now scale above 10% when a faction was outnumbered over the course of the preceding week, up to a maximum of 30% additional quest rewards and experience. In War Mode, an outnumbered faction now has access to a weekly quest to slay 25 level 120 players of the opposing faction, rewarding a piece of item level 370 Arathi Warfront gear and 1000 Artifact Power. War Mode can now be disabled in any rested area. It can still only be enabled in Stormwind or Orgrimmar. The Honor system reward vendor has been consolidated. Strongboxes rewarded for unrated PvP have been improved. They now contain Marks of Honor, gold, PvP consumables, and profession materials. Strongboxes granted on victories contain greater amounts of these rewards. Rated Arenas and Rated Battlegrounds now grant an additional 50% Conquest for all Conquest reward weeks prior to week 9. Honor pet rewards have consolidated to new vendors in Stormwind and Orgrimmar. The relentless snow in Alterac Valley has raised the height of Stonehearth graveyard, making it more challenging for the Horde to assault. Lokholar the Ice Lord and Ivus the Forest Lord are now eager for immediate battle, and no longer linger in the Field of Strife for 15 minutes after summoned. Decomposing Aura now only applies to Blood and Unholy Death Knights. Heartstop Aura now only applies to Blood and Frost Death Knights and decreases the cooldown recovery rate of abilities by 30% to enemies (was 20%). Dark Simulacrum cost reduced to none (was 20 Runic Power) and cooldown decreased to 20 seconds (was 25 seconds). New PvP talent (Frost, Unholy): Transfusion. Generates 20 Runic Power and reduces the Runic Power cost of Death Strike by 50% for 7 seconds. New PvP talent: Dead of Winter. After your Remorseless Winter deals damage 5 times to a target, they are Stunned for 4 seconds, and your Remorseless Winter's cooldown is increased by 25 seconds and its radius is reduced to 5 yards. Chill Streak now deals up to 6% of the target’s health in Frost damage (was 3%). Deathchill reworked. It is now applied by Remorseless Winter and Chains of Ice (was Death Grip), and now roots the target in place for 4 seconds. Delirium now lasts for 15 seconds (was 8 seconds). New PvP talent: Lichborne. Become Undead for 10 seconds, all damage is reduced by 30%, and you are immune to Stun, Snare, Fear and Root effects. You cannot move faster than 50% of normal speed. New PvP talent: Life and Death. When targets afflicted by your Festering Wound are healed, you are also healed for 10% of the amount. Your Virulent Plague now erupts for 400% of normal eruption damage when dispelled. New PvP talent: Necromancer’s Bargain. The cooldown of your Apocalypse is reduced by 45 seconds, your Apocalypse applies Crypt Fever to the target, and Crypt Fever deals up to 8% of the target’s maximum health in Shadow damage over 4 seconds. Healing spells cast on this target will refresh the duration of Crypt Fever. New PvP talent: Raise Abomination. Raises an Abomination for 25 second which wanders and attacks enemies near where it was summoned, applying Festering Wound when it melees targets, and affecting all those nearby with Virulent Plague. Demonic Origins no longer increases damage outside of Metamorphosis. Mana Break no longer increases damage based on missing mana, now increases the mana cost of spells by 30% for 10 seconds, and now costs 50 Fury. Mana Rift now has an 8 yard range (was 20 yards), now explodes after 2.5 seconds (was 2 seconds) and now costs 50 Fury. Demonic Trample now increases speed by 175% for 3 seconds, now shares charges and cooldown with Infernal Strike, and targets can only be affected by its knockdown effect once every 45 seconds. Ferocious Bite deals 20% less damage when engaged in combat with enemy players. Deep Roots now increases the amount of damage required to cancel your Entangling Roots and Mass Entanglement by 400% (was 200%). Faerie Swarm now disarms targets for 5 seconds (was 8 seconds). Moonkin Aura now causes Starsurge to grant 4% spell critical strike chance to 8 allies within 40 yards for 18 seconds, stacking up to 3 times. King of the Jungle now increases healing received (was damage done). New PvP Talent: Heart of the Wild - You become further adept in Caster Form and Bear Form. New PvP Talent: Leader of the Pack - While in Cat Form, you increase the melee and ranged critical chance of all allies within 40 yards by 5%. Also causes affected targets to heal themselves for 4% of their maximum health when they critically hit with a melee or ranged attack. The healing effect cannot occur more than once every 6 seconds. Savage Momentum now reduces the remaining cooldown of Tiger’s Fury, Stampeding Roar, and Survival Instincts by 10 seconds. Freedom of the Herd is now available to Guardian Druids. Mana regeneration reduced by 20% when engaged in combat with enemy players (was a 30% reduction). Early Spring now also grants Full Bloom when Wild Growth heals 6 allies. New PvP talent: Mark of the Wild - Raid members take 15% less damage from Fire, Frost, and Arcane damage over time and area of effect spells and abilities. New PvP Talent: Master Shapeshifter - Your Guardian, Balance, or Feral Affinity is amplified, granting an additional effect. Nourish has been redesigned and is now an active spell. Regrowth healing increased by 15% in PvP. Eminence reduces the cooldown of Transcendence by 20 seconds (was 5 seconds), and is no longer available to Windwalker Monks. Grapple Weapon cooldown reduced to 45 seconds. Chrysalis reduces Life Cocoon by 45 seconds (was 30 seconds). New PvP talent: Alpha Tiger - Attacking new challengers with Tiger Palm fills you with the spirit of Xuen, granting you 30% haste for 8 seconds. This effect cannot occur more than once every 30 seconds per target. Chi Burst is no longer cloned by or has its damage reduced by Storm, Earth, and Fire. New PvP talent: Reverse Harm - Heals a friendly target for 8% of their maximum health and causes 100% of the amount healed to instantly be dealt to the nearest enemy as Nature damage within 5 yards. Generates 2 Chi. Ride the Wind no longer increases the cooldown of Flying Serpent Kick. New PvP talent: Turbo Fists - Fists of Fury now deals full damage to all targets hit, reduces all targets movement speed by 90%, and you Parry all attacks while channeling Fists of Fury. New PvP talent: Wind Waker - When you or allies are snared, the snare is instantly removed, and their movement speed is prevented from being reduced below 100% for 4 seconds. Blessed Hands now increases the amount of charges of Blessing of Protection and Blessing of Freedom by 1 (was all of your Blessing spells). Cleanse the Weak now also removes Diseases and Poisons on targets healed by your Holy Light. Divine Vision now also reduces Shadow damage by 15% dealt by damage over time and area of effect to allies within your aura. Flash of Light healing increased by 15% in PvP. Holy Light healing increased by 25% in PvP. ​Hand of the Protector healing reduced by 40% when cast on friendly players that are engaged in combat with enemy players. Execution Sentence damage reduced by 25% when engaged in combat with enemy players. ​Wake of Ashes damage reduced by 25% when engaged in combat with enemy players. Word of Glory healing reduced by 40% when engaged in combat with enemy players (was 20%). Mana regeneration reduced by 15% when engaged in combat with enemy players (was a 20% reduction). Trinity now also causes Smite, Penance, and Shadowfiend critical strike chance to be increased by 25% when you have Atonement on 3 or more allies. Shadowmend healing increased by 25% in PvP. Heal healing increased by 50% in PvP. New PvP talent: Holy Word: Concentration - Blesses the ground in an 8 yard radius that causes allies who stand in it to be immune to silence and interrupt effects for 8 seconds. New PvP talent: Greater Heal - Heals a target for 65% of their maximum health. Edge of Insanity now reduces damage taken by 5% (was 10%). Shiv now costs 35 Energy, and now applies Deadly, Wound, and Crippling Poison to the target. Earth Fury (Honor Talent) removed. Lightning Lasso is no longer dispellable and deals damage of 48% of the target’s health over 6 seconds. Forked Lightning has been removed and it’s functionality has been merged into Ride the Lightning. Ride the Lightning now causes Stormstrike to cast a Chain Lightning when 3 enemy targets are nearby. If there aren’t 3 enemies nearby the Shaman, lightning strikes the two furthest enemy targets within 40 yards. ​Static Cling (PvP Talent) has been removed. New PvP talent: Ancestral Gift - Activating Spiritwalker’s Grace causes you to become immune to Silence and Interrupt effects for 5 seconds. Chain Heal healing increased by 50% in PvP. New PvP talent: Cleansing Waters - Chain Heal and Healing Rain have a 20% increased critical strike chance, and dispel all harmful magical effects from targets when they critically heal. Earthen Wall Totem absorbs 30% less damage per attack when engaged in combat with enemy players. Healing Surge healing increased by 15% in PvP. Healing Wave healing increased by 25% in PvP. Rippling Waters (PvP Talent) has been removed. Curse of Weakness now reduces attack power (was physical damage), and its effect is increased to 30% (was 25%). Fear mana cost reduced to 5% of maximum mana (was 10%). New PvP talent: Demon Armor - Protects the caster, increasing maximum health by 10% and increases armor by 275%. Dragon Charge is no longer subject to the global cooldown. Disarm duration increased to 6 seconds (was 4 seconds). Master and Commander now also grants 15% additional health to your Rallying Cry when used. Duel duration increased to 8 seconds (was 6 seconds). Sharpen Blade duration increased to 6 seconds (was 4 seconds). Integrated new multi-threaded performance optimizations for clients using DirectX 12 and Metal. All systems that are capable of DirectX 12 now default to DirectX 12.